July 22, 2011, L. G. Crabo. 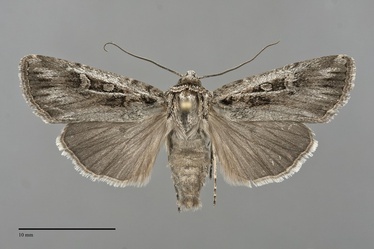 Euxoa absona is a medium-sized Euxoa (FW length 15–18 mm) with a silver-gray forewing with brown-gray shading in the cell and terminal area and variably on the rest of the mid-wing, black outlines of the three forewing spots, and a dark hindwing in the cell and a pale costa that flies in southeastern Idaho during the summer. The forewing has a pointed apex. The ground color is light to medium-dark silver-gray. Darker brown-gray is present in the cell, the terminal area, and often on the mid-wing near the cell. Black streaks are present in the terminal area, which is widest opposite the cubital vein and in the fold. The costa and cubital vein are lightest gray, most evident in relatively dark specimens. An irregular black basal dash is present. The lines are only evident as double gray spots on the costa, although the antemedial line is often evident near the base of the claviform spot. No trace of the median line is present, and the position of the postmedial line is indicated as a transition from the darker median area to the lighter subterminal area in dark specimens. The subterminal line is absent except for the transition from light to dark. The terminal line is black, thin or broken into spots. The fringe is light to medium-dark gray. The orbicular and reniform spots are fairly small, partially outlined in black and filled with light gray peripherally and brown-gray centrally. The orbicular spot is oval, often open toward the costa. The reniform spot is kidney-shaped, usually incomplete at the anterior and posterior ends. The claviform spot is black, prominent due to brown-gray filling. The hindwing is dark gray or brown-gray with a thin discal spot and thin terminal line. The hindwing fringe is white with a two-tone ochre and gray base. The head and thorax are powdery silver gray and brown-gray, with a black transverse line across the mid-collar. A frontal tubercle is present. The male antenna is biserrate. Euxoa absona species belongs to the subgenus Euxoa. 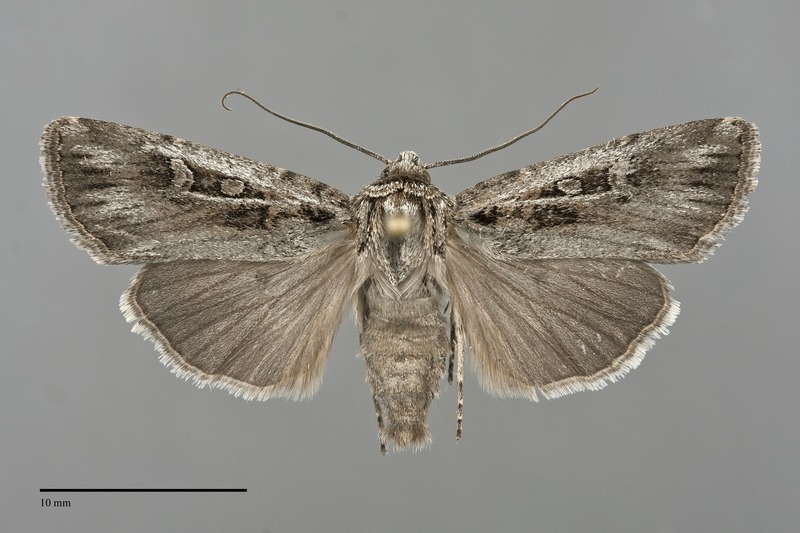 This species can be identified by its silver gray forewing with brown-gray cell, black spots, obsolete transverse lines, streaked terminal area, and dark hindwing. It is most similar to Euxoa silens but has more contrasting cell and terminal area, darker outlines of the spots, and a darker hindwing. The pale costa resembles that of Euxoa idahoensis and related species, but they are brown rather than silver-gray in color. The early stages of E. absona are unknown. This species is found in dark bunchgrass steppe in the Central Basin and Range Ecoregion. 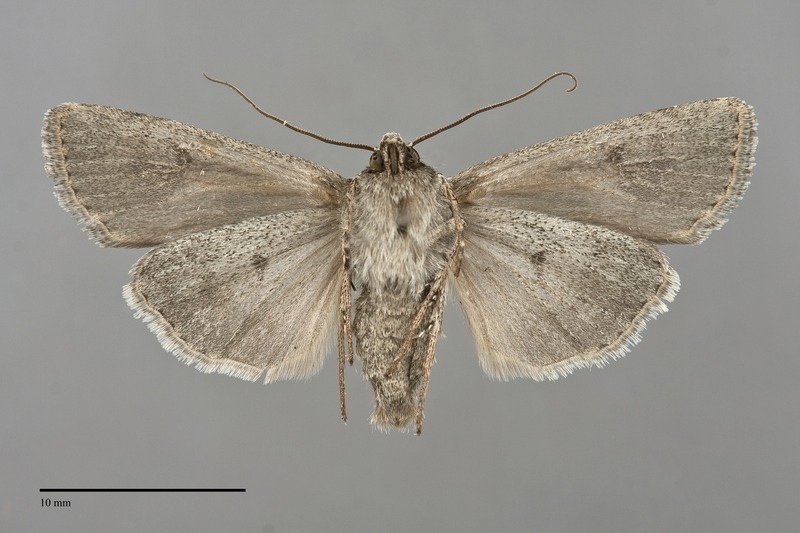 Euxoa absona has only been found in extreme southeastern Idaho in the Pacific Northwest. It might occur elsewhere in southern Idaho and southern Oregon based on its distribution in Nevada. This species has a restricted range in the Intermountain Region of the southwestern United States. It has been collected most commonly in Nevada, but also occurs in eastern and northern California. The larva of E. absona is unknown. The adults of E. absona fly during late spring and summer. The only Idaho record is from late July. It is nocturnal and comes to light.